If you're shopping for a height-adjustable desk and chair set for your child, then you probably already know there are several different options available to you. In this article I'll compare a few of the best children's desk and chair sets available for purchase online. I will offer a quick breakdown of the materials used to construct each desk, provide an overview of the build quality of each desk and chair set, discuss their stability (and safety), and highlight the fun features that make each one unique and will ultimately help you choose the best height-adjustable children's desk for your child. Why Buy a Height-Adjustable Desk and Chair for Your Child? First - every child is different (and changing every day! ), and you want your child to be comfortable while writing, drawing, or playing at their desk no matter how fast or slow they grow, and what position they are most comfortable working in. Second - it's a better investment than a static-height child's desk and chair because it will grow with your child and last longer. Most of the children's desks I review below are used by kids from 3 to 10 years old. Third - many children become so involved with their writing, drawing, or studying that slouching and leaning in toward their desk is commonplace. 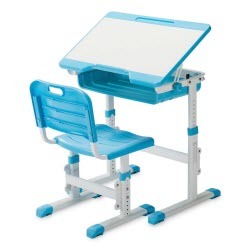 A height-adjustable children's desk set can be raised or lowered to avoid unnecessary strain and to improve posture as your child develops and grows. 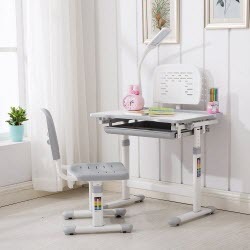 There are numerous adjustable-height children's desk sets available online and it can be time consuming to pick the right one. I provide a detailed review of each of these desk and chair sets below, but if you're pressed for time I think you'll like any of these 4 options, which I have looked at and selected because they're affordable, well-made and have received mostly positive reviews. If you'd like to learn a little more about the pros and cons of my picks, you can find those below. All of these desks are available for purchase on Amazon. Why Buy the VIVO Height Adjustable Children's Desk & Chair Set? This desk is priced well, easy to put together, and has a variety of features that you and your child will love. The desk tilt stoppers will allow your child to adjust the height and angle of the desk without pinched fingers. The frame is solid steel. It’s light enough for kids, but will stand up to abuse and feels very sturdy when a child is seated or standing at the desk. It comes in a variety of colors, allowing you to match it to the decor in your child’s room or play area. Features like a 40-degree tilt, smooth-gliding under-desk drawer, backpack hook, and ventilated chair are very well thought out. Most customers who rated this children’s desk and chair set poorly complained about the chair. Many felt that the chair did not hold up to heavy use by their child and failed after 1-2 years. Our Take: around $100 we think this is a good value, and the quality was better than we expected at this price-point. 88% of customers gave this a 4 or 5-star rating and we think you’ll be happy with your purchase of the VIVO Children's Desk & Chair Set. Why Buy the Mecor Children's Desk Chair Set? The desk tilt can be ordered with or without a built-in lamp which offers 3 levels of brightness. The illumination provided can help to avoid eye-strain and slouching. The frame is solid steel, and the desk is sturdy for this price in both the seated and standing position, and when the desktop is tilted to form a drafting table. It comes in 3 colors, allowing you to match it to the decor in your child’s room or play area. Features like the backpack and water bottle hooks, 40-degree desk top tilt, and ventilated chair were great. If your child is very active or likes to push things, you may want to go with a heavier model like the Einstein Kids desk, otherwise this desk is popular, well-reviewed, and we recommend it. Our Take: a terrific all-around value when ordered with or without the lamp. 100% of customer reviews online rated this desk at 4 or 5- stars, making this children’s desk and chair set from Mecor a solid choice I feel you won’t regret. 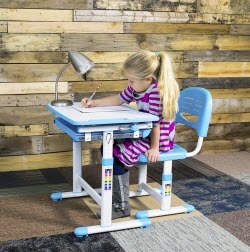 Why Buy the SLYPNOS Ergonomic Adjustable Children's Desk? This is the least expensive height-adjustable desk and chair set we recommend, and we think it has most of the same features as the more expensive models with a slightly lower build-quality. If money is tight, this is a great value and I think your child will love it. This desk is recommended for children age 3-14, with a desk height that adjusts from 20-30” and is designed to grow with children from 39”-67” tall. Eco-Friendly construction. While this desk is manufactured overseas, the set is SGS and CPSIA certified. While it feels less sturdy than some of the more expensive desks with a similar design, it is sturdy enough to support 154 pounds, which is impressive considering how lightweight it is. In addition to a 40-degree tiltable desk top and a backpack hook, I appreciated the non-slip feet which protects your floors and adds stability to the desk. Some customers reported that the pre-drilled holes didn’t align properly, making assembly difficult. Of the listed desks it had the lowest overall customer rating at 4.3 / 5 stars. Our Take: the best combination of low price and acceptable quality you’ll find on this list. 85% of customers rated this SLYPNOS children’s desk set 4 or 5 stars. It’s a good option, but not my favorite. Why Buy the Einstein Kids Desk Set? While this is almost double the price of most of the other height-adjustable childrens desk and chair sets we reviewed, we think it’s worth the added expense if your budget allows you to purchase it. The manufacturing is higher-quality, and it offers a few extra features you won’t find on the cheaper models. This desk tilts more than any other desk on the list. While an extra 5 degrees of tilt doesn’t seem like much, it makes a difference because it allows your child to get the desk positioned at the perfect angle in any position. This desk’s writing surface was an inch and a half wider than the other desks. It had the sturdiest feel of any desk we reviewed. At 38.4 pounds, this childrens desk and chair set is easy to move, but has 10 pounds on everything but the VIVO desk set. This desk comes with non-slip leveling feet to make it perfectly flat for your little one. Some customers reported that the large storage drawer was difficult to open and close out of the box because it wasn’t on its track. Our Take: If you’re looking for a height adjustable childrens desk and chair set that is well-made and has all the bells and whistles, the Einstein Kids model is the one you should buy. It’s the best one we reviewed here, and if you aren’t put-off by the price we think it’s a good purchase. 100% of customers rated this desk either 4 or 5 stars. Choosing a desk that looks inviting and fun, in a color that matches their room or play area and that your child will be excited to sit at is important. While these desks aren't the traditional hardwood desks that many of us grew up with, they're just as solid, will grow with your child, and include a number of features that our old children's desks just didn't have. There are plenty of other options if you'd prefer a more traditional desk set for your child, like this one from Melissa & Doug (a brand I love - my daughter has a ton of toys and items from them), but my advice is to invest in an adjustable-height children's desk and chair set that will grow with your child and last you several years. No matter what desk you purchase, one tip I have is to consider painting the work surface with chalkboard paint or with clear dry-erase paint to make it a surface that your kids can write and draw on. It's a fun, personal touch and a low-cost, easy project that makes your children's desk set one-of-a-kind.